You have added Tangled Webs Strapless Dress in Ivory into shopping cart. FINAL SALE. This fun strapless party dress with a unique design at the bust comes in two color options for you to choose from. The Tangled Webs Strapless Dress is fully lined. The bust is made of a mesh fabric with an embroidered design that reminds us of tangled webs. The chiffon skirt has a flowy cut. An exposed back zipper completes this dress. The Tangled Webs Strapless Dress would be perfect for any semi-formal party or gathering. Try pairing it with wedges, pumps, or strappy heels. The ivory color would be perfect for brides to wear to a rehearsal dinner or bridal shower. The black is a great classic little black dress with a twist! Details: Fully lined. Lightly padded bust. Exposed back zipper. 100% polyester. Hand wash cold water separately. Color will bleed. No bleach. Hang to dry. Small measurements: Length from top of bust to hemline: 27". Bust: 32". You have added Tangled Webs Strapless Dress in Ivory into Wishlist. You have added Tangled Webs Strapless Dress in Ivory for Stock Notification. 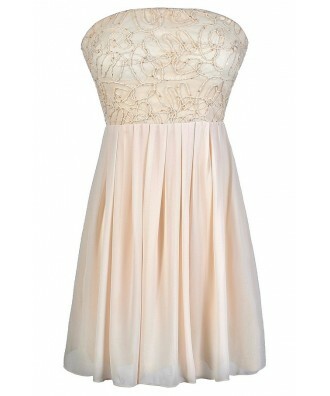 You have set Tangled Webs Strapless Dress in Ivory as a loved product. 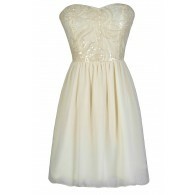 You have removed Tangled Webs Strapless Dress in Ivory as a loved product.